Overpopulation does not depend only on the size or density of the population, but on the ratio of population to available sustainable resources. It also depends on how resources are managed and distributed throughout the population. Overpopulation is one of the hazards and serious problem, which creates a great obstacle in the way of national development. It is estimated that growth in human population affect the global land use pattern available for agriculture, forest land cover, nearby area of different type of water bodies. The rapid increase of human population is putting extraordinary pressure on our natural resources available e.g. land, water, ecosystem services etc. 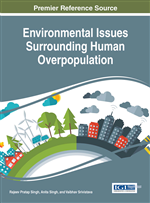 The purpose of this chapter is to highlight the various environmental implications of overpopulation and rural-urban migration which in turns affect the land use pattern of world. Deforestation and loss of ecosystems that sustain global atmospheric oxygen and carbon dioxide balance is also another implication. In past few years, cities grow due to the rapid increase in world population and the migration of people from villages to cities. In the developing countries, the population growth has been more unstable& some cities are facing unplanned and uncontrolled settlements (e.g. slums) at the densely populated areas. Human beings have maximum population on earth although it decreases with high death rate due to illnesses, infections, famines; accidents and war but comparatively fertility rates should be high for species survival. Many factors affect the rate of change of population. As number of individual increases, the problems related to it are also increased. The main reasons that affect growth of population are the natality, mortality, immigration and migration. The natality is the ratio between births and individuals in given population and time. The mortality is the ratio of number of deaths to individuals present in given area and time. Migration is the number of people enters in or out of an area. The rate of change of population size is affected by these factors in a particular region. Overpopulation has been initiated due to the increase in birth rates and the decrease in death rates in present time due to better medical facilities and progresses in the field of medicine. Movement of people to developed countries for better job opportunities, war, and natural disasters like hurricanes, cyclones, earthquakes etc. There is great pressure on the natural resources (water, land) due to overpopulation. Among all the natural resources, Land is the most important one. All agriculture, animal and forestry productions depend on the land productivity. The entire land ecosystem, which composed of soil, water and plant, and soil biodiversity, is used to fulfil the community demand for food, energy, water requirement. The unmanageable use of land is the main reason for destruction of our environment. For the sustainable development of an area, regular monitoring of land cover/ land use changes is essential. Overpopulation, consumption, overuse, wastage and misuse of resources have strained the earth’s carrying capacity. The demands that put pressure on our environment are also alter the future of sustainability on earth. Regular monitoring of urban land cover/ land use changes is necessary for sustainable development of an area. In India, increase in population size due to unplanned activities which leads to urbanization that reduces the agricultural land. This is also having serious impacts on the resources base of the region. The development of urban area takes place either in radial way nearby a developed city or linearly along the highways. Life of Indians depends on agriculture and similar activities in rural areas. As per Indian census during 2011, the population of country is 1,210,193,422 (Provisional Census, 2011). The Indian populations increased with a decadal growth of 17.64%. In this chapter, the impacts of increased population on land use types and availability of land for agriculture, industry, construction of dams, water bodies etc. and in turn their impact on environment will be discussed. This dispersal of biotic community also occurs on the basis of availability of food and abiotic parts of environment interact with the biotic community. Habit of food and interaction between food chain also helps the population to survive in any area which is termed as food web; the individuals get more options of food than traditional way in its habitat.